Oh, Elijah. I love what you’re up to up there in Bardstown. That 12 year old barrel proof beast of a bourbon? It’s simply one of my favorite bourbons of the past few years (though I wish it were a bit easier to find, and I wish the prices hadn’t crept up at retail from $40 to $60 in most places – but thank you anyway for keeping it coming). I was impressed with your 21 year old single barrel release last year. And now you’ve come out with another limited release, of 23 year old single barrel bourbon – actually distilled and barreled just a few months apart from the 21 year old, but left to age a bit longer. That 21 year old single barrel showed well – not too woody, plenty of intrigue, a fine example of a nicely aged bourbon. Which, let’s face it, is an increasingly precious thing. So I was curious to see how two more years in the barrel might show itself. Of course, Heaven Hill purposefully chose barrels for this new 23 year old that would best show at an advanced age – this time coming from the middle floors of their rickhouses. Let’s see how it stacks up to the 21. First off – the visuals. Comparing this side by side with the 21 year old release from last year, you’ll first note the same lovely bottle design (it better be at these prices), now with a dark camouflage-green label (and the edge of the label looking even more camo-like). We’re huntin’ old whiskey here. As for the stuff inside, the color of the 23 is just a notch deeper and more auburn than the 21, as might be expected. On the nose, I thought (and still think) the 21 was like “sawdust baking in the summer heat in an old wooden barn… rum raisin mixed with a bit of purple grape… (working) together surprisingly well… hints of rye spice underneath, but not at all sharp or green.” This single barrel 23 follows a very similar profile – these are close cousins – but I’m getting a deeper brown sugar, and the grape notes take a backseat to ripe peach – like peaches caramelizing in a skillet, with a bit of almond paste thrown in. There’s a bit more dark oak, and still a good amount of heat (this is a powerful 90 proof). When I first opened this bottle, the wood notes often overpowered the fruit and spice and flattened everything else out, but over the course of a week being open, the bottle really settled down and heady whiffs of cinnamon brown sugar helped to push the nose into truly lovely territory – not too dark or deep or woody at all, simply harmonious. For the 23 year old, I could copy and paste my first thoughts on tasting the 21, because they still ring true: “strong and persistent burn on the tongue, not unpleasant, but… strong for 90 proof. It manages to be full and thick without feeling syrupy, with a mouth-coating presence that seeks out every nook and cranny. There’s an almost-burnt-caramel quality to it, but it doesn’t comes across as sweet since the wood and clove-like baking spices are there tackling the sugar. This may not help to say, but it feels old in a way that is neither astonishing (as in the Pappy 23 year old) nor upsetting.” What I find, though, is that the extra age on the Elijah 23 is tipping this a bit out of balance, coming across as dried out at times. I wouldn’t call this over the hill, but it’s wobbling at the precipice. A cube of ice mellows things out and brings out the butterscotch notes, but, just as it did in the 21, the ice strips away the unique aged character of the bourbon as well, making it more pedestrian. My preference on the 23 is to drink it neat. I previously gave the Elijah 21 an “Excellent,” and I think the 23 delivers to that level on the nose – but I also find that the additional two years bring the 23 down a notch in terms of balance and liveliness – at least for the single barrel that I tried. Yes, if you want to experience an older bourbon, this is a great option. Like I said, any 23 year old bourbon is inherently precious stuff, and quite hard to find these days. 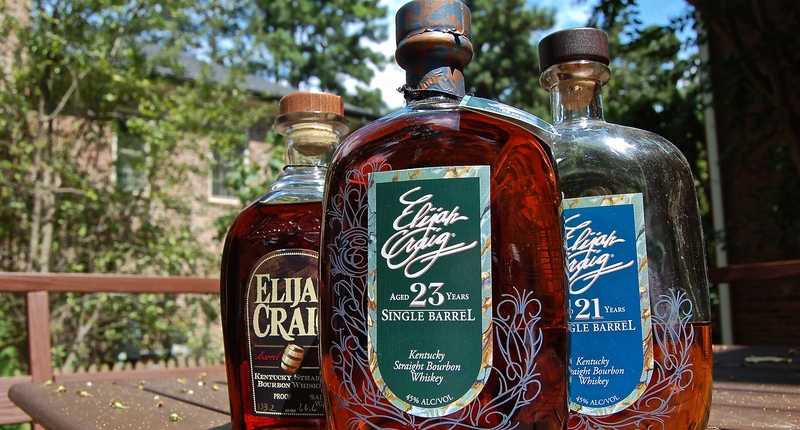 In fact, this limited release of Elijah Craig will likely be evaporating from store shelves faster than a 23 year old bourbon makes its way through the barrels and up towards the angels. I commend Elijah Craig / Heaven Hill for continuing to set aside good barrels to keep giving folks the opportunity to try extra aged bourbon (and consciously seeking the right barrels to go the distance). But I also look forward to allocating my bourbon dollars to the much younger 12 year old barrel proof version! Please note that there WILL be variation from barrel to barrel – thus is the nature of single barrel bottlings. Full Disclosure: Tasting sample provided by Heaven Hill. Thanks for the review. 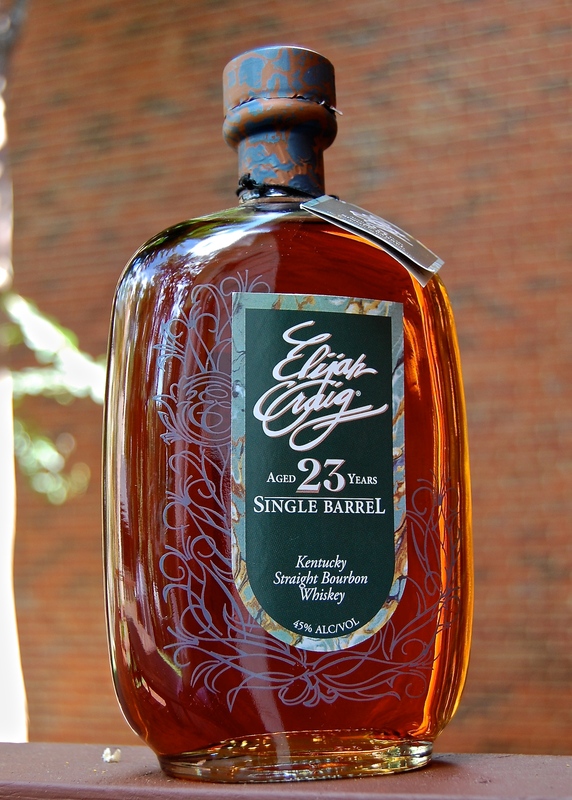 I’m a huge ECBP fan, its everything I want in a bourbon with an unbeatable price. I’ll pass on this one and perhaps order it in a bar sometime just to try it out instead of sinking $200 into a bottle.